The Belgian foreign minister said the Dalai Lama was "perfectly free" to visit Belgium last week and decided to cancel the trip on his own, though Tibetan activists claimed that China had pressured Belgium to stop him from coming. The Dalai Lama had been scheduled to attend a gathering of Tibetan groups in Brussels on Friday but canceled his trip two days before, saying in a statement that the Belgian government had shared with him their "predicament on account of pressure from the People's Republic of China." The statement did not specify what type of pressure China had exerted but connected it to an upcoming China tour by Belgium's crown prince. Speaking to reporters at U.N. headquarters on Monday, Belgian Foreign Minister Karel de Gucht said Belgium had granted the Dalai Lama a visa and was prepared to welcome him. "He was perfectly free to come to Belgium and to address the meeting and he decided himself not to come," de Gucht said. De Gucht said the Belgian government told China that they had granted the Dalai Lama a visa, and the Chinese "reacted negatively." He did not say whether any pressure was placed on Belgium to cancel the appearance. The London-based Free Tibet Campaign accused Belgium last week of bowing to pressure from Beijing and called on de Gucht to apologize for Belgium's willingness to "sacrifice its own values and take orders from a repressive regime" for economic interests. Like many European countries, Belgium is actively seeking ways to boost trade with China, and Crown Prince Philippe is expected to head a 300-member trade delegation to Beijing this week. 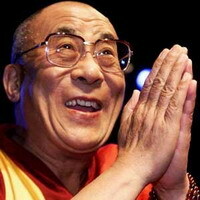 Beijing has for years campaigned aggressively against the Dalai Lama, seeking to deny international legitimacy to the Nobel Peace Prize winner and undermine his enduring popularity in Chinese-controlled Tibet. The day after the Dalai Lama announced the cancellation last week, China warned other countries against developing close ties with him. Chinese Foreign Ministry spokeswoman Jiang Yu stressed that he is not just a religious figure but a political entity advocating Tibetan independence from the mainland, which China rejects.